“My personal experience happened when I took a friend to a nearby lake for a hike. He had never been to the lake, so we hiked to a viewing tower at one end of the lake. We took some pictures and enjoyed the view for awhile. I said, 'Okay, we should head back now' and we came down off the viewing tower. I told my friend to go ahead and I would catch up...I needed to relive myself. David took off and I turned around and did my thing. When I turned around I saw my friend walk off the trail about 100 feet ahead of me, and walk towards the edge of the lake. He had this mischievous grin on his face. I kept my eye on him as I walked towards where he stepped off the trail; I had the thought he was trying to hide on me. So when I got to where he stepped off the trail, I ran ahead with the intention of hiding on him. I ran a minute maybe two and as I rounded a turn in the trail my friend was standing there calmly waiting for me. I was shocked. There is no way he could have got here as I just left him in my dust. I was looking back at him when I ran off and knew he was behind me. Only one trail, so no way for him to get to where I found him. What was this? Can anyone offer an explanation? I went back to the lake and the same area with a couple of different friends a year or so later. As we walked the trail I was telling them of the incident I had previously. One guy pulled out his cell phone and recorded the conversation. When we played it back later,a voice that should not have been there but was heard clearly to say 'Robert. Get out of here!' There was no way my friend could get to where I met him on the trail. I left him in my dust and he could only come from behind me now. It was NOT my friend BUT it was a something that took on his likeness. When I turned around to head up the trail, I saw my 'friend' step off the trail. As I walked towards him my eyes were on him the whole time; probably 30 or 40 seconds. I never took my eyes off him until I got to where he stepped off the trail and I ran. I must emphasize there was no way for him to get ahead of me. I was on the only trail. Again, I ran hard for a minute or more and suddenly he was on the trail waiting for me. 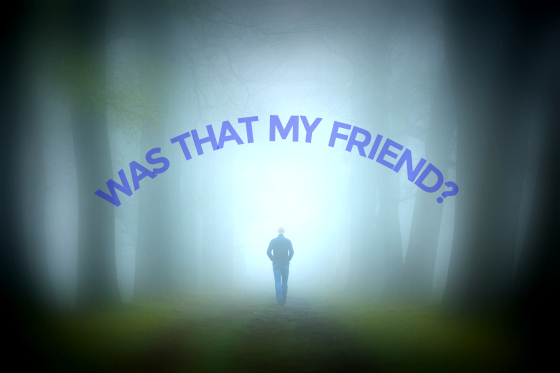 It wasn't him that stepped off the trail...it was something else. Whatever it was, I saw him/it as plain as day and it was an exact replica of my friend. I believe the intention was to have me follow him/it to the edge of the lake. When I saw the grin on his face. I had the thought he was trying to hide on me so I decided to run and hide on him. I have to say I am thankful I did.